We love bridal portraits! Capturing the beauty of the bride and creating images of the bride that she will love is one of our top priorities at all weddings. While doing classic closeups and full-body portraits is a timeless tradition we will always include, the types of bridal portraits we love the most feel unposed, free, and relaxed. We also strive to create portraits to reflect the brides' personalities themselves - whether that is a nervous giggle, a serene gaze or a dramatic spin. This bride is a true lover of adventure and was up for anything to get unique bridal portraits. 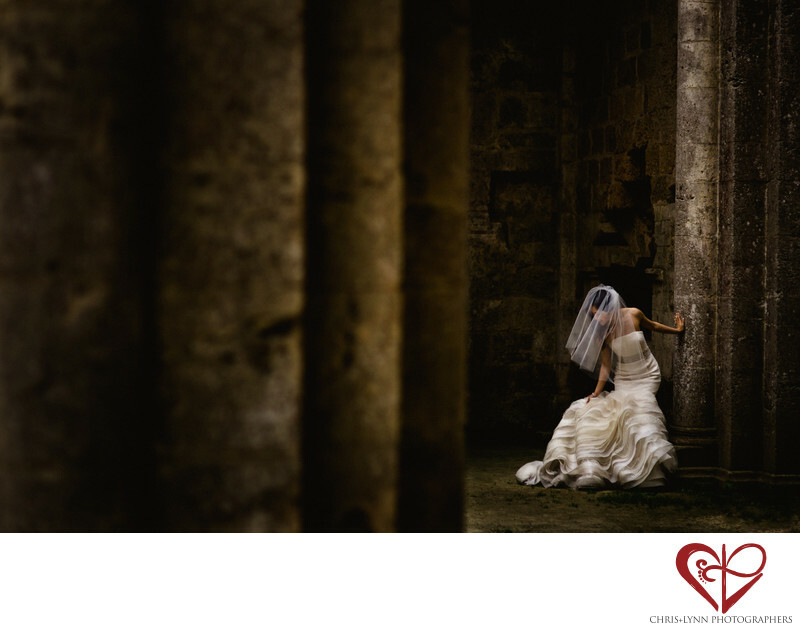 Her wedding was in Italy so we scouted out a ruined ancient monastery for her photos. Wandering among the gothic pillars as shafts of light penetrated the crumbling walls and ceilings, she stopped to adjust the layers of her gorgeous Vera Wang dress. The delicate shape of her body combined with the dramatic lighting of her veil resulted in an image that captures one of those "in-between" real moments. This photo was a winner in Junebug Weddings "Best of the Best" wedding photographs of 2015. More of R+G's destination wedding in Florence, Italy can be viewed in the Featured Wedding section of the Chris+Lynn website here. Another one of our favorite Italian destination wedding locations is Hotel Caruso, located in Ravello on Italy's Amalfi Coast. View a featured Amalfi wedding in the Featured Weddings section of the Chris+Lynn website here. 1/640; f/2.0; ISO 400; 85.0 mm.